The kites were flying high in the brisk northeast wind on a rough, January morning just a mile off Lake Worth, Florida. We were short-handed, just angler Capt. Vince Daniello and me, with mate Rhett Bailey to keep us in line in the cockpit of the Viking 60. The waves were tall, lifting the big boat then dropping it into a trough as Vince worked the portside baits and I matched his efforts on the starboard. Each kite was suspending two live goggle-eyes and it was our job to keep them splashing on the surface against the rise and fall of the boat to entice sailfish. If you ask me, we were doing a hell of a job! 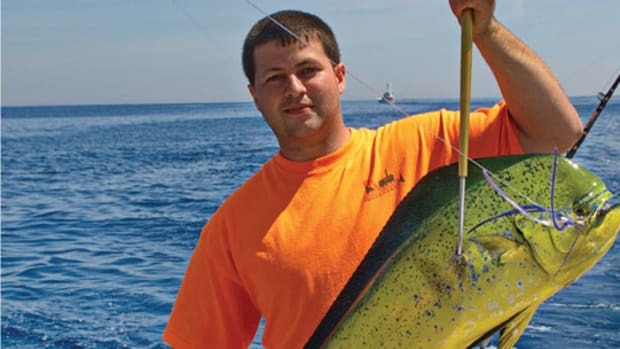 In short order we’d managed three single hookups and a double, working the fish quickly on 20-pound-test outfits as Capt. Ryan Higgins maneuvered the big boat to our advantage with a deft hand. Bailey danced around the pitching deck always in position for each release as the fish were brought alongside. The pace would only get more frenetic as the sun climbed higher in the sky and more sails piled into the area just off the reef. It became one of those days I’d store in my memory banks for years to come, always there for a momentary daydream when I began to feel trapped in the office. Winter can bring fits of cold, rough weather to South Florida’s Atlantic coast and with it comes the annual migration of Atlantic sailfish. 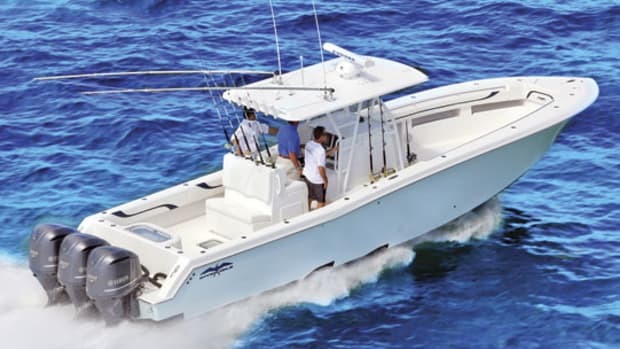 Each passing front brings the possibility of an epic bite, a concentration of sailfish balling schools of frantic baitfish as they make the southward trek toward the Keys and beyond. When you hit it right the action can be faster than even a well-practiced tournament team can manage. I know—I’ve been there! Sails are pack hunters. 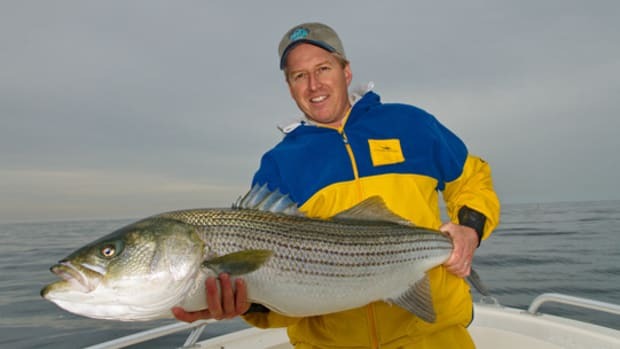 They use their numbers and oversized dorsal fins to bust up dense schools of baitfish so they can zero in on the loners. And they can come together here in numbers that boggle the mind and strain the senses. 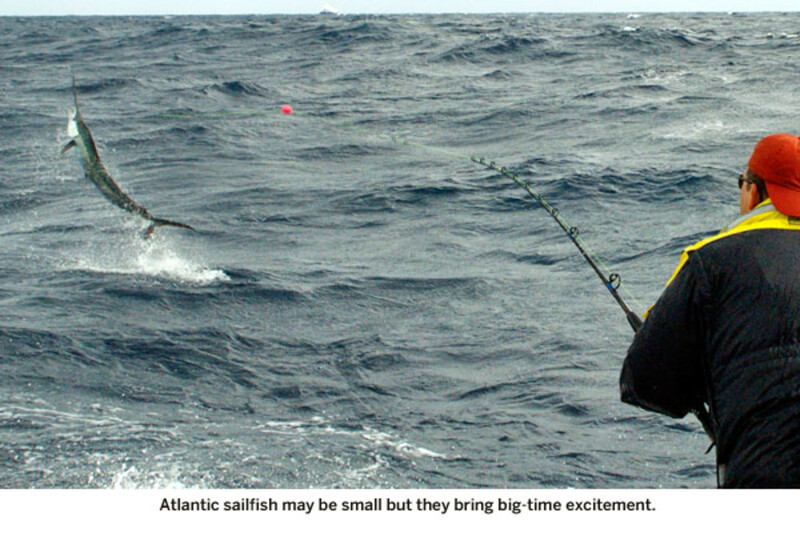 For the uninitiated it might seem that the attention given to Atlantic sailfish is out of proportion to the diminutive size of the species. 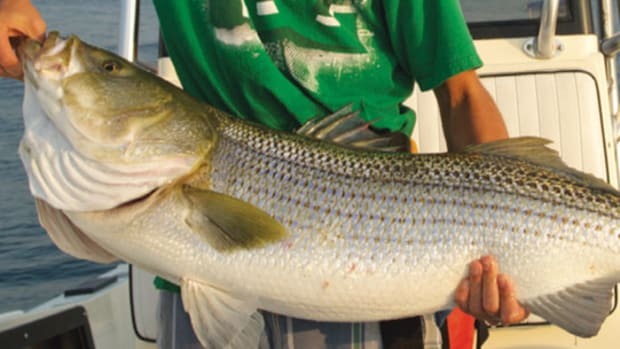 Granted, they typically weigh only between 40 and 50 pounds, while a really big one might top 75. So what’s all the fuss? Whatever sails lack in size they more than make up for in speed, acrobatic prowess, and sheer numbers. Match them against a 20-pound-class outfit and you’ve got the ideal foil—light enough to be challenging, heavy enough to best the fish quickly for a righteous release. 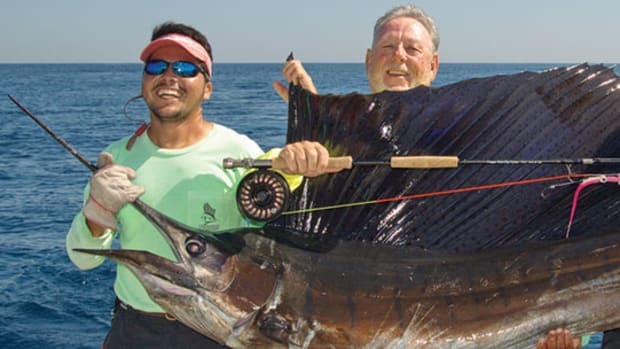 There’s no need to kill a perfectly good sailfish—it’s an unwritten edict that has been ingrained in anglers here for the last 50 years and reinforced by a period of declining stocks that made this Florida icon a rare catch for almost two decades. Today, sails are relatively abundant, the result of an evolving conservation ethic among anglers and the work of the Recreational Fishing Alliance, a political-action organization (for which I’m a part-time corporate-relations manager and a fishery consultant) that brought about the prohibition of commercial longline fishing in critical areas like the Straits of Florida almost 15 years ago. 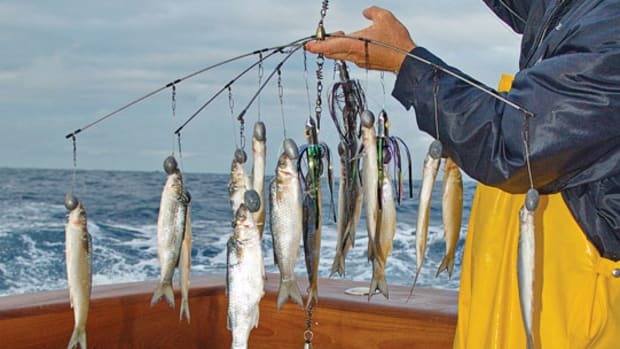 How good can the fishing get? Quite simply, it’s world class. 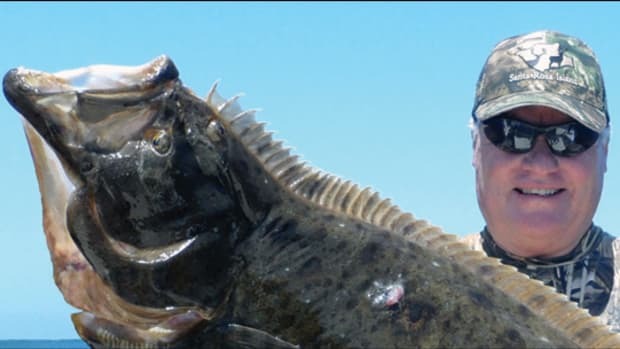 Combine radical numbers of fish with their slashing feeding style and acrobatic tendencies and you’ve got a game fish that rewards technique and luck in nearly equal measure. 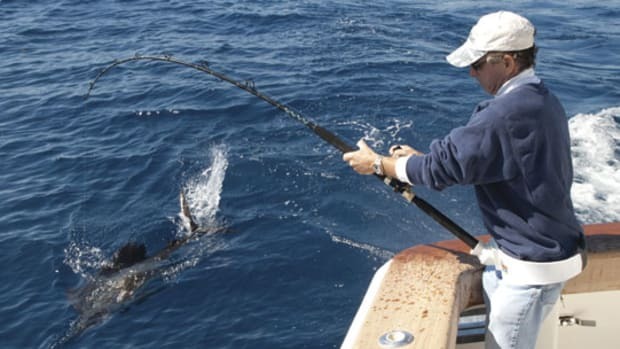 Though they can be available pretty much year-round, sailfish have been the focal point of the winter fishing season in Florida for nearly 100 years. Spindlebeaks have spawned dozens of tournaments with dates that fall between December and March, including such historic events as the Silver Sailfish Derby, which has been in existence since 1935, and the Buccaneer Cup Sailfish Tournament (for which I serve as tournament director) that celebrated its 50th anniversary last year. Even legendary angler Ernest Hemingway cut his billfishing teeth on them, and so have generations of fishermen who followed. 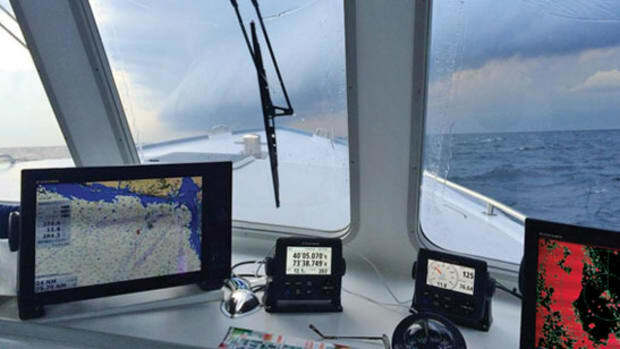 When I reflect on days spent in pursuit of Atlantic sailfish like the one I had in that Viking cockpit, it’s certainly not hard to understand why.